I previously mentioned a video showing how schlieren photography could be used to film the propagation of sound. This video by the Harvard Natural Science Lecture Demonstrations, presents different experiments with schlieren photography. The complete description of the setup used, as well as the explanation of the effect, is also available on the associated web page. 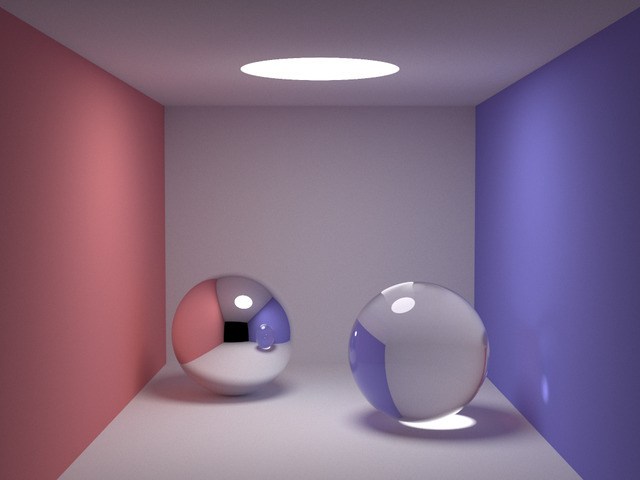 On his website Kevin Beason presents a Monte Carlo ray tracer written with 99 lines of C++, generating a picture of a Cornell box with global illumination. Beyond the interesting experiment and the fact it can generate a binary of 4kB, I find very valuable the fact there are slides explaining all the code. Last weekend the demogroup Mercury released at Tokyo Demo Fest the final version of their invitation to the upcoming Revision party: a 64kB demo called Epsilon. While the complexity of the scenes is very limited, the rendering, seemingly a raymarching shader, features a couple of very noteworthy real-time effects including ambient occlusion, reflexion (up to two iterations it seems) and refraction, caustics, and an hexagonal bokeh depth of field.